A vintage photo of the Derby Daiquiri in its custom glass honoring the Florida Derby. When you think of the Mint Julep, you immediately think of the Kentucky Derby. 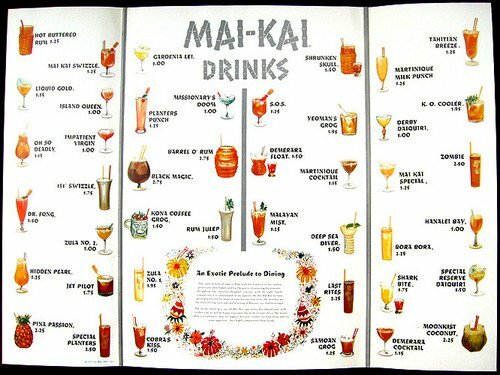 In 1959, when the organizers of the $100,000 Florida Derby sought a similar drink to promote their race, they turned to The Mai-Kai. 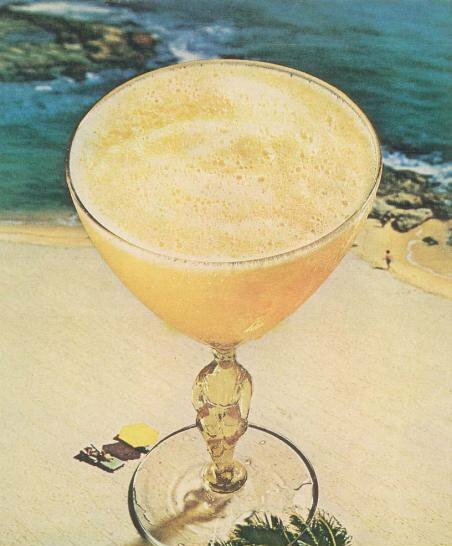 The Derby Daiquiri, created by mixologist Mariano Licudine, became the race’s official drink. The Florida Derby, which began in 1952, is still run today every spring with a purse now set at $1 million. Winners usually go on to compete in the Kentucky Derby. The Derby Daiquiri immediately gave the race and The Mai-Kai a huge publicity boost. 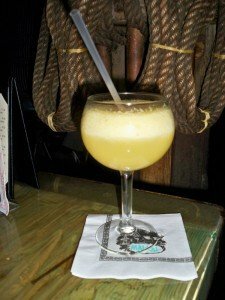 It also won first prize in a Rums of Puerto Rico cocktail competition and was featured as Esquire magazine’s drink of the month. When New York’s Cue magazine printed the recipe, restaurants all over Manhattan started serving the “$100,000 drink,” Jeff “Beachbum” Berry wrote in the chapter on Licudine and The Mai-Kai in his 2007 book, Sippin’ Safari. The lounge at the Newark, N.J., airport served the drink to vacationers departing for Fort Lauderdale. Not to be outdone, Berry wrote, Mai-Kai owners Jack and Bob Thornton sent a portable Tiki bar to Fort Lauderdale Airport, where Licudine himself served his creation to arriving passengers. In his thatch-roofed “goodwill wagon,” Licudine also met VIP arrivals at train stations and cruise ship docks, in the process becoming something of a local hero, Berry wrote. 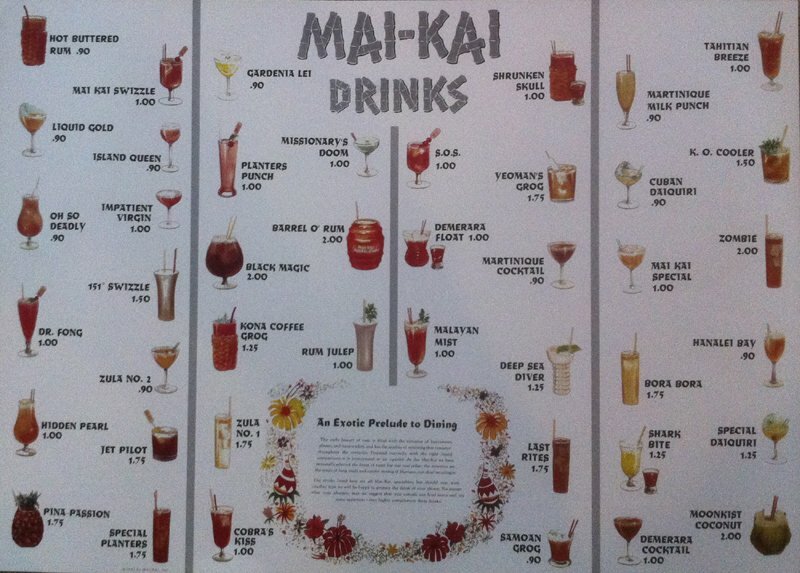 The drink’s first menu sightings were on the 1959 Molokai bar menu and main drink menu. 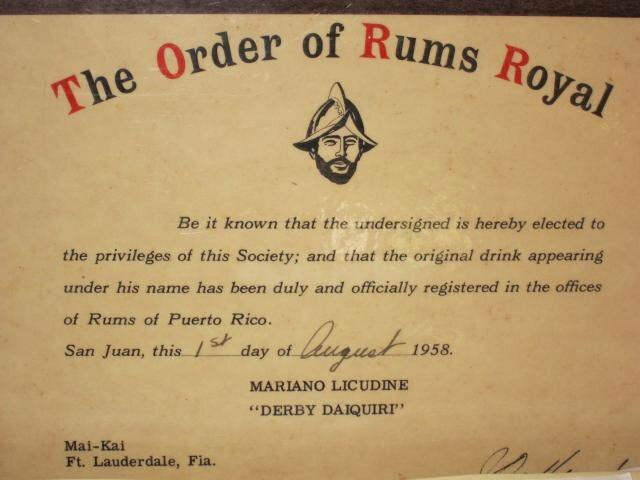 A certificate issued by Rums of Puerto Rico [see photo] officially registered the drink on Aug. 1, 1958. The 1957 menu that’s sold in The Mai-Kai gift shop does not include the Derby. Instead, you’ll find the Cuban Daiquiri. This was a different drink, a descendant of a Don the Beachcomber cocktail of the same name. Perhaps it became a politically incorrect name with revolutionary turmoil brewing, but it was gone by 1959. 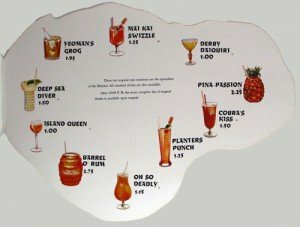 Curiously, the only other menu changes around this time involved daiquiris: the Special Daiquiri was renamed the Special Reserve Daiquiri and the Floridita Daiquiri was introduced. But the Derby was the clear favorite out of the gate. It’s unclear what inspired Licudine to create this orange-flavored classic. Perhaps it was just the abundance of Florida’s state fruit, which to this day still makes The Mai-Kai’s drinks distinctive (see: Mystery Drink, Sidewinder’s Fang, S.O.S.). 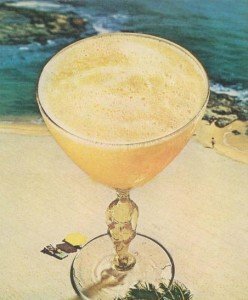 Licudine also worked for Don the Beachcomber for decades before coming to The Mai-Kai and likely was exposed to the Beachcomber’s Daiquiri (white rum, lime, Cointreau orange liqueur). 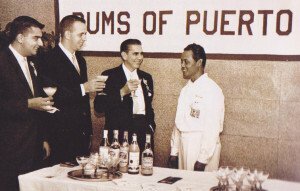 We also know that in the late 1950s, Licudine was asked to come to Cuba, Puerto Rico and other Caribbean islands to teach bartenders at the big resorts and hotel chains how to make proper tropical drinks. “Resort owners wanted to turn the Caribbean into Hawaii,” Berry said during a seminar at The Hukilau in June 2013. 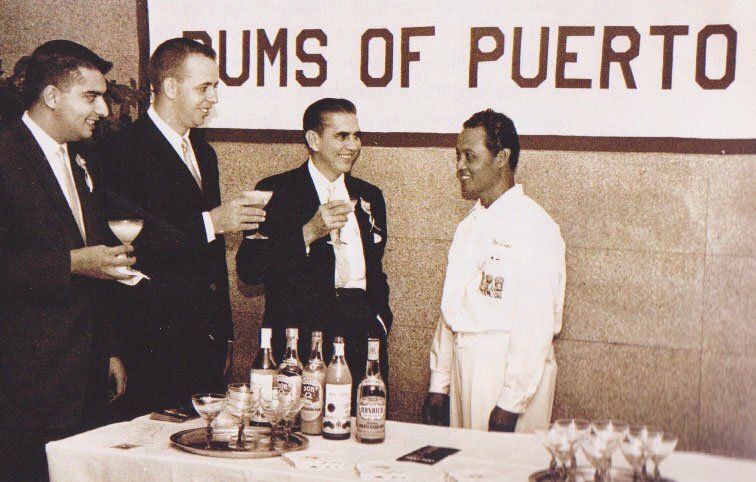 It’s ironic that an American Tiki bartender who was born in the Philippines was “teaching Jamaicans how to make Planter’s Punch, and teaching Cubans how to make daiquiris,” Berry said. While he was in Cuba, he might have stopped by the legendary El Floridita (aka La Florida), the bar where the daiquiri was perfected and popularized by famed bartender and owner Constantino Ribalaigua Vert, aka “Constante.” The two never met (Constante died in 1952), but Licudine probably encountered his handiwork. 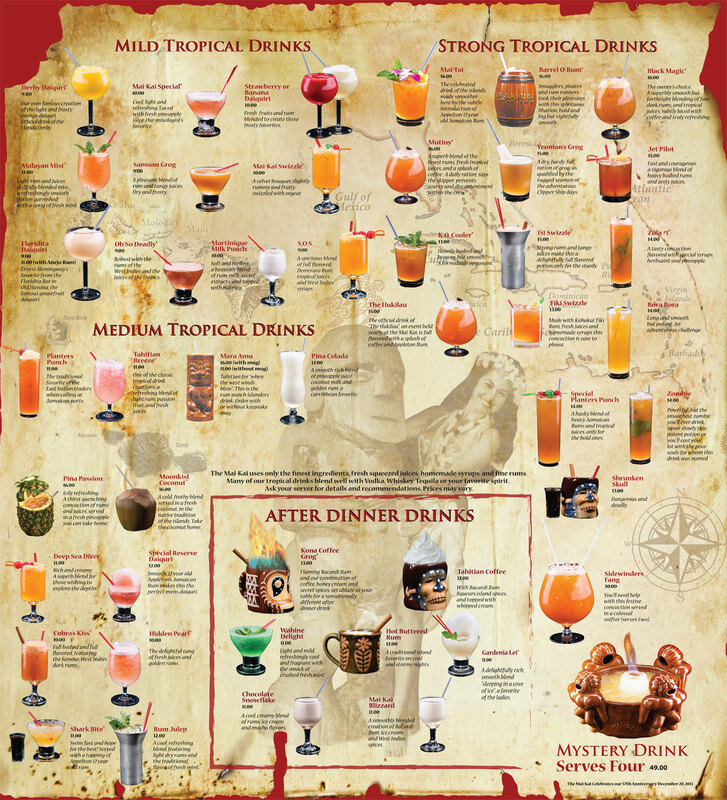 Beachbum Berry’s award-winning new book, Potions of the Caribbean: 500 Years of Tropical Drinks and the People Behind Them (2013, Cocktail Kingdom), includes recipes for several of Constante’s daiquiris featuring orange flavors. 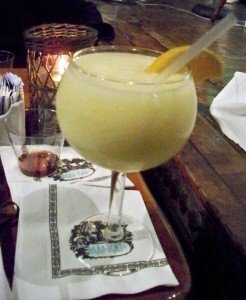 La Florida Daiquiri Number 2 includes both curacao and orange juice with white Cuban rum, fresh lime juice and sugar. It was shaken and strained, but many of El Floridita’s daiquirs are blended like Licudine’s Derby. The Swank Pad’s Tim “Swanky” Glazner promises the full story of the creation of the Derby Daiquiri in his book on the history of The Mai-Kai that’s in the works. 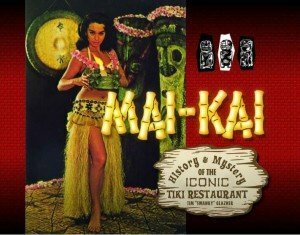 But whatever the inspiration, the late 1950s was the perfect time for a refreshing new drink to hit the scene and help establish the early reputation of both Licudine and The Mai-Kai. 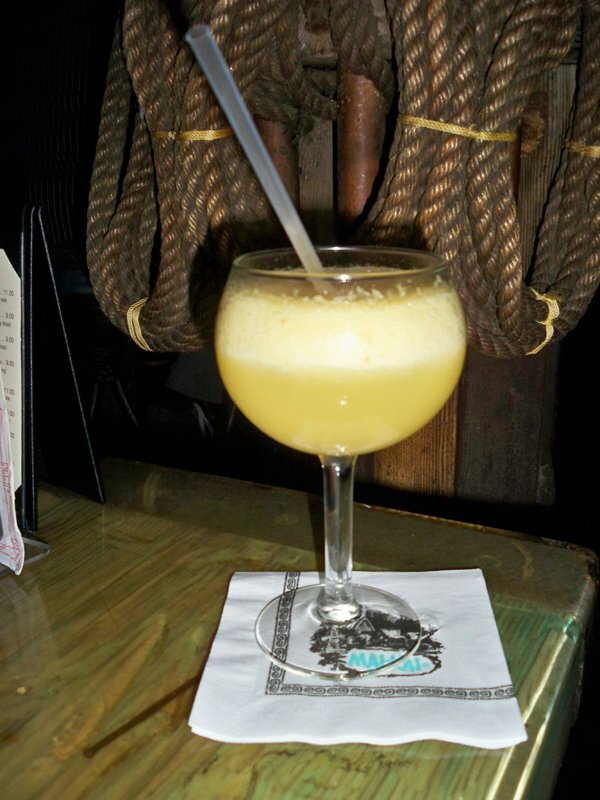 Our own famous creation of the light and frosty orange daiquiri, official drink of the Florida Derby. Review: A twist on the classic frozen daiquiri, a bit sweeter and less tart. 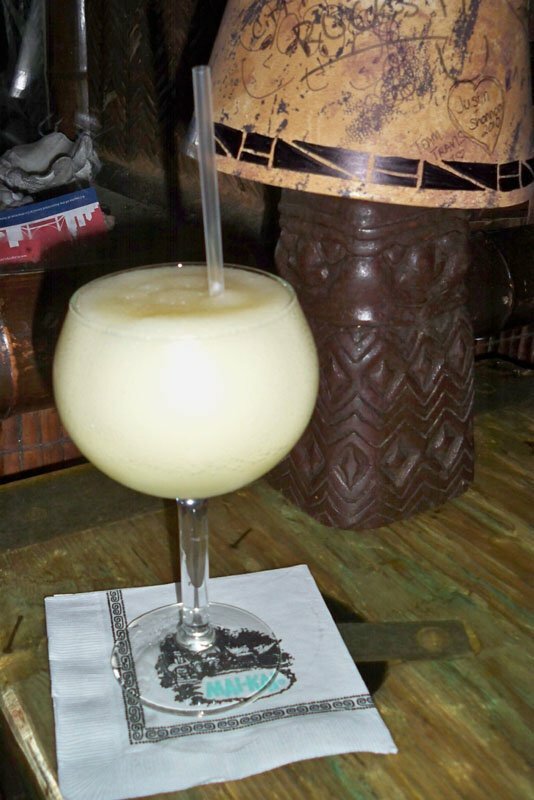 Ancestry: The Derby Daiquiri – with its very tropical OJ-lime-rum flavor notes – was created by mixologist Mariano Licudine in 1958 and was featured in 1959 as the Florida Derby’s answer to the Kentucky Derby’s bourbon-based Rum Julep. 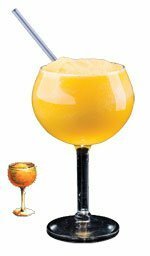 Bilge: For a time, the Derby Daiquiri was served with a “Spanish Comb” ice shell. It also had its own custom jockey glass to commemorate its association with the Florida Derby. The glass is extremely rare, but it occasionally pops up on eBay. Beachbum Berry wrote about one such find on his blog. Bonus bilge: Ask for a “double-blended Derby” and you’ll get a less icy, smoother daiquiri. The intense blending also somehow gives the drink a hint of vanilla flavor. Blend with a handful of crushed ice for 15 seconds or until smooth. Serve in a small wine goblet. 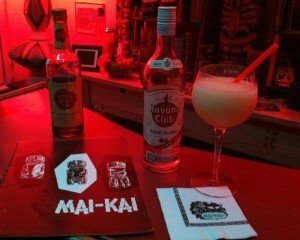 * Since its origins date back to a Rums of Puerto Rico cocktail contest, The Mai-Kai has always used a Puerto Rican rum such as Don Q in the Derby Daiquiri. But do yourself a favor and try it with Havana Club if you have access to it. The fine Cuban rum adds a more finely-crafted taste and exotic quality to this classic. * As we discovered at Beachbum Berry’s Rumposium at the 2011 Hukilau (see photo above), floating a bit of high-end rum such as Lemon Hart 151 is a great way to punch up this otherwise mild cocktail. Try it with your favorite aged rum. This entry was posted in Cocktail reviews, Cocktails, Cocktails, Culture, History, History, Mai-Kai, Recipes, Rum and tagged Beachbum Berry, Mai-Kai, Mariano Licudine, recipe, rum, South Florida. Bookmark the permalink. I have been looking into this more and I think I am correct in saying that the Derby Daiquiri was not on the original menu in 1956. It is confusing because the drink menus from 1956-7 all the way up into the 60s all said copyright 1957. The only way to tell the age is by the drink prices. My oldest menus, judged by price, also do not have the Derby Daiquiri on them. In fact, the very fact that the drink isn’t on them tells us the drink was not an original from the opening. All this gets back to the stories I have been told of the idea in 1958-59 by Leonce Picot to have a drink for the Gulfstream Derby like the Mint Julep was to the Kentucky Derby. He sold them on the idea and Mariano made the drink and it was named official and the rest is history. I think the Derby Daiquiri was added in 1959. Thanks for the dogged research. I’ve adjusted the story above to reflect the new facts. The earliest references I’m finding online to the Derby Daiquiri is 1959. They’re running the derby today. In honor of the event, I mixed one up today. Only, I had Bacardi dark and cinnamon syrup in stock. Tried to float a half ounce of Meyers Dark, also…..it was pretty good once I got past the Meyers. Think I’ll leave that out next time. BTW, in the picture of Mariano above, the man in the suit in the middle is Leonce Picot, assistant manager from 1957-67. We have several of the jockey glasses that the Mai Kai served the daiquiris in. Quite beautiful.